Transparent and conducting fluorine doped tin oxide (FTO) films were deposited on glass substrates at 300°C using nebulized spray pyrolysis. The fluorine concentration in the precursor solution was varied from 0 to 40 at.%. UV-Visible spectroscopy, Hall effect measurement, EDX, SEM and ToF-SIMS were employed to investigate the optoelectronic properties of the film. Among the samples prepared, the highest average transmittance in the visible range (77.42%) and the lowest electrical resistivity (4.63 x 10-4 Ω-cm) was obtained from the tin oxide film doped with 40 at.%F in solution. The SEM images showed that the as-deposited FTO film's surface consist of non-uniform grains with agglomerates of crystallites. The EDX and ToF-SIMS spectra confirmed the presence of the fluorine dopant in the tin oxide lattice. Depth profiling studies, carried out for the first time showed that fluorine distribution in the FTO-40 at.% film was constant up to 300nm from the surface confirming the effectiveness of the spray pyrolysis technique in doping tin oxide thin films. These results suggest the potential application of the film as a TCO layer for optoelectronic and photovoltaic devices. L. I. Ballesteros, C. J. Vergara, A. Santillan, C. Bandoquillo, K. C. Aganda, and A. Somintac. 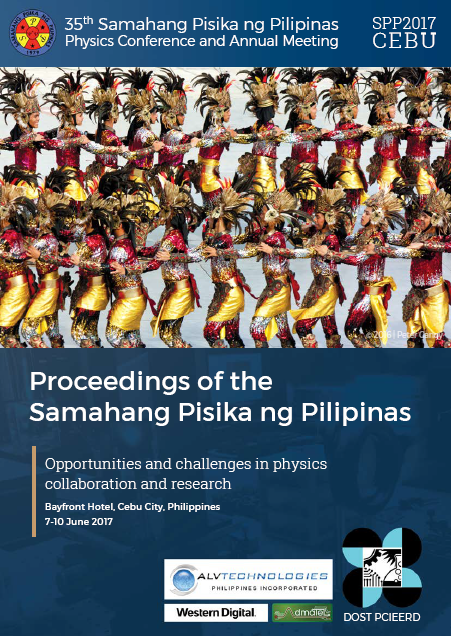 Effect of fluorine doping on the electrical and optical properties of spray pyrolyzed tin oxide films, Proceedings of the Samahang Pisika ng Pilipinas 35, SPP-2017-PA-42 (2017). URL: https://paperview.spp-online.org/proceedings/article/view/272.